Jesus Christ in a Coptic icon. 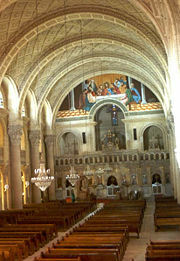 The Coptic Orthodox Church of Alexandria is the official name for the largest Christian church in Egypt. The Church belongs to the Oriental Orthodox family of churches, which has been a distinct church body since the Council of Chalcedon in 451 C.E., when it took a different position over Christological theology from that of the Eastern Orthodox and Western churches, then still in union. The foundational roots of the Church are based in Egypt, but it has a worldwide following. According to tradition, the Coptic Orthodox Church was established by Saint Mark the apostle and evangelist in the middle of the first century (approximately 42 C.E.). (Eusebius of Caesarea, the author of Ecclesiastical History in the fourth century, states that st. Mark came to Egypt in the first or third year of the reign of Emperor Claudius, i.e. 41 or 43 C.E.) The head of the church and the See of Alexandria is the Pope of Alexandria and Patriarch of All Africa on the Holy See of Saint Mark. Traditionally, the Coptic language was used in church services, and the scriptures were written in the Coptic alphabet. However, due to the Arabization of Egypt, service in churches started to witness increased use of Arabic, while preaching is done entirely in Arabic. Native languages are used, in conjunction with Coptic and Arabic, during services outside of Egypt. Coptic Orthodox Christians celebrate Christmas on January 7 (Gregorian Calendar), which coincides with December 25, according to the Julian Calendar. Christmas according to the Coptic calendar was adopted as an official national holiday in Egypt since 2002. Today, the Coptic Church is still renowned for its contribution to the development of early Christian monasticism and for its legacy of erudite scholarly study. Egypt is identified in the Bible as the place of refuge that the Holy Family sought in its flight from Judea (Matthew 2:12-23). Furthermore, the Egyptian Church, which is now more than nineteen centuries old, regards itself as the subject of many prophecies in the Old Testament. For example, Isaiah, the prophet, says "In that day there will be an altar to the Lord in the midst of the land of Egypt, and a pillar to the Lord at its border" (Isaiah Ch. 19:19). The first Christians in Egypt were mainly Alexandrian Jews such as Theophilus, whom Saint Luke the Evangelist addresses in the introductory chapter of his gospel. When the church was founded by Saint Mark during the reign of the Roman emperor Nero, a great multitude of native Egyptians (as opposed to Greeks or Jews) embraced the Christian faith. In the second century, Christianity began to spread to the rural areas, and scriptures were translated into the local language, namely Coptic. Archaelogical evidence corroborates this spread of Christianity with the discovery of writings found in Bahnasa, in Middle Egypt, which date around the year 200 C.E., and a fragment of the Gospel of John, written in Coptic, which was found in Upper Egypt and can be dated to the first half of the second century. In the fourth century, an Alexandrian presbyter named Arius began a theological dispute about the nature of Christ that spread throughout the Christian world and is now known as Arianism (not to be confused with the racist Nazi ideology Aryanism). The Ecumenical Council of Nicea 325 C.E. was convened by Emperor Constantine under the presidency of Saint Hosius of Cordova and Saint Alexander of Alexandria to resolve the dispute and eventually led to the Nicene Creed. The Creed, which is now recited throughout the Christian world, was based largely on the teaching put forth by a man who eventually would become Saint Athanasius of Alexandria, the chief opponent of Arius. Another theological dispute in the 5th century occurred over the teachings of Nestorius, the Patriarch of Constantinople who taught that God the Word was not hypostatically joined with human nature, but rather dwelt in the man Jesus. As a consequence of this, he denied the title "Mother of God" (Theotokos) to the Virgin Mary, declaring her instead to be "Mother of Christ," Christotokos. When reports of this reached the Apostolic Throne of Saint Mark, Pope Saint Cyril I of Alexandria acted quickly to correct this breach with orthodoxy, requesting that Nestorius repent. When he would not, the Synod of Alexandria met in an emergency session and a unanimous agreement was reached. Pope Cyril I of Alexandria, supported by the entire See, sent a letter to Nestorius known as "The Third Epistle of Saint Cyril to Nestorius." This epistle drew heavily on the established Patristic Constitutions and contained the most famous article of Alexandrian Orthodoxy: "The Twelve Anathemas of Saint Cyril." In these anathemas, Cyril excommunicated anyone who followed the teachings of Nestorius. For example, "Anyone who dares to deny the Holy Virgin the title Theotokos is Anathema!" Nestorius however, still would not repent and so this led to the convening of the First Ecumenical Council of Ephesus (431 C.E. ), over which Cyril I of Alexandria presided. The First Ecumenical Council of Ephesus confirmed the teachings of Saint Athanasius and confirmed the title of Mary as "Mother of God." It also clearly stated that anyone who separated Christ into two hypostases was anathema, as Athanasius had said that there is "One Nature and One Hypostasis for God the Word Incarnate" (Mia Physis tou Theou Loghou Sesarkomeni). When in 451 C.E., Emperor Marcianus attempted to heal divisions in the Church, the response of Pope Dioscorus—the Pope of Alexandria who was later exiled—was that the emperor should not intervene in the affairs of the Church. It was at Chalcedon that the emperor, through the Imperial delegates, enforced harsh disciplinary measures against Pope Dioscorus in response to his boldness. The Council of Chalcedon, from the perspective of the Alexandrine Christology, has deviated from the approved Cyrillian terminology and declared that Christ was one hypostasis in two natures. However, in the Nicene-Constantinopolitan Creed, "Christ was conceived of the Holy Spirit and of the Virgin Mary," thus the foundation of the definition according to the Non-Chalcedonian adherents, according to the Christology of Cyril of Alexandria is valid. It is important to note the change in the Non-Chalcedonian definition here, as the Nicene creed clearly uses the terms "of," rather than "in." Coptics also believe that the Pope of Alexandria was forcibly prevented from attending the third congregation of the council from which he was ousted, apparently the result of a conspiracy tailored by the Roman delegates. Before the current positive era of Eastern and Oriental Orthodox dialogues, Chalcedonians sometimes used to call the non-Chalcedonians "monophysites," though the Coptic Orthodox Church in reality regards monophysitism as a heresy. The Chalcedonian doctrine in turn came to be known as "dyophysite." A term that comes closer to Coptic Orthodoxy is miaphysite, which refers to a conjoined nature for Christ, both human and divine, united indivisibly in the Incarnate Logos. The Coptic Orthodox Church of Alexandria believes that Christ is perfect in His divinity, and He is perfect in His humanity, but His divinity and His humanity were united in one nature called "the nature of the incarnate word," which was reiterated by Saint Cyril of Alexandria. Coptics, thus, believe in two natures "human" and "divine" that are united in one hypostasis "without mingling, without confusion, and without alteration." These two natures "did not separate for a moment or the twinkling of an eye" (Coptic Liturgy of Saint Basil of Caesarea). Coptics suffered under the rule of the Byzantine Eastern Roman Empire. The Melkite Patriarchs, appointed by the emperors as both spiritual leaders and civil governors, massacred the Egyptian population whom they considered heretics. Many Egyptians were tortured and martyred to accept the terms of Chalcedon, but Egyptians remained loyal to the faith of their fathers and to the Cyrillian view of Christology. One of the most renowned Egyptian saints of that period is Saint Samuel the Confessor. The Muslim conquest of Egypt took place in 639 C.E. Despite the political upheaval, Egypt remained a mainly Christian land. However, the gradual conversions to Islam over the centuries changed Egypt from a Christian to a largely Muslim country by the end of the twelfth century. This process was sped along by persecutions during and following the reign of the Fatimid caliph Al-Hakim bi-Amr Allah (reigned 996–1021 C.E.) and the Crusades, and also by the acceptance of Arabic as a liturgical language by the Pope of Alexandria Gabriel ibn-Turaik. During Islamic rule, the Copts needed to pay a special tax called the jizya. This tax was abolished in 1855. The position of the Copts began to improve early in the nineteenth century under the stability and tolerance of Muhammad Ali's dynasty. The Coptic community ceased to be regarded by the state as an administrative unit and, by 1855, the main mark of Copts' inferiority, the Jizya tax, was lifted. Shortly thereafter, Christians started to serve in the Egyptian army. The 1919 revolution in Egypt, the first grassroots display of Egyptian identity in centuries, stands as a witness to the homogeneity of Egypt's modern society with both its Muslim and Christian components. There are about 15 million Coptic Christians in the world: They are found primarily in Egypt under the jurisdiction of the Coptic Orthodox Church of Alexandria (roughly 11 million). There are also significant numbers in the diaspora in countries such as the United States of America, Canada, Australia, France, Germany, and Sudan. In addition, there are between 350,000 and 400,000 native African adherents in East, Central and South Africa. Although under the jurisdiction of the Coptic Orthodox Church, these adherents are not considered Copts, since they are not ethnic Egyptians. Some accounts regard members of the Ethiopian Orthodox Tewahedo Church (roughly 45 million), the Eritrean Orthodox Tewahedo Church (roughly 2.5 million), as members of the Coptic Orthodox Church. This is however a misnomer, since both the Ethiopian and the Eritrean Churches, although daughter churches of the Church of Alexandria, are currently autocephalous churches. In 1959, the Ethiopian Orthodox Tewahedo Church was granted its first own Patriarch by Pope Cyril VI of Alexandria. Furthermore, the Eritrean Orthodox Tewahdo Church similarly became independent of the Ethiopian Tewahedo Church in 1994, when four bishops were consecrated by Pope Shenouda III of Alexandria to form the basis of a local Holy Synod of the Eritrean Church. 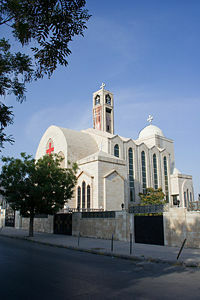 In 1998, the Eritrean Church gained its autocephelacy from the Coptic Orthodox Church when its first Patriarch was enthroned by Pope Shenouda III of Alexandria. 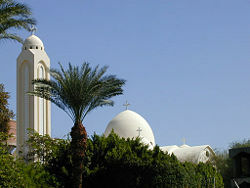 The Coptic Orthodox Church of Alexandria whose adherents make up between 92 and 93 % of Egypt's total Christian population of 11.8 to 12 million adherents. Since the 1980s, theologians from the Oriental (Non-Chalcedonian) Orthodox and Eastern (Chalcedonian) Orthodox churches have been meeting in a bid to resolve theological differences, and have concluded that many of the differences are caused by the two groups using different terminology to describe the same thing. In the summer of 2001, the Coptic Orthodox and Greek Orthodox Patriarchates of Alexandria agreed to mutually recognize baptisms performed in each other's churches, making re-baptisms unnecessary, and to recognize the sacrament of marriage as celebrated by the other. Previously, if a Coptic Orthodox and Greek Orthodox wanted to marry, the marriage had to be performed twice, once in each church, for it to be recognized by both. Now it can be done in only one church and be recognized by both. Originally, the Bishop of Alexandria was first known just as the Bishop of Alexandria. It continued to be so, until the Church grew within and all over the Egyptian Province, and many Bishops were consecrated for the newly founded parishes all over the towns and cities. The Bishop of Alexandria, being the successor of the first Bishop in Egypt consecrated by Saint Mark, was honored by the other Bishops, as first among equals "Primus inter Pares." This was in addition to the appropriate honorary dignity, which was due by virtue of being the Senior Bishop of the main Metropolis of the Province, Alexandria, which also the Capital and the main Port of the Province. This honor was bestowed by making the Senior Bishop an “Archbishop,” thus presiding in dignity of honor over all the Alexandrine and Egyptian Bishops. The appellation of “Pope” has been attributed to the Bishop of Alexandria since the Episcopate of Heraclas, the thirteenth Bishop of Alexandria. All the clergy of Alexandria and Lower Egypt honored him with the appellation “Papas,” which means “Our Father,” as the Senior and Elder Bishop among all bishops, within the Egyptian Province, who are under his jurisdiction. This is because Alexandria was the Capital of the Province, and the preaching center and the place of martyrdom of Saint Mark the Evangelist and Apostle. The leader of the Coptic Orthodox Church of Alexandria, is known as Pope and Lord Archbishop of the Great City of Alexandria and Patriarch of All Africa on the Holy Orthodox and Apostolic Throne of Saint Mark the Evangelist and Holy Apostle. Additionally, the title “Patriarch” means the Head or the Leader of a Tribe or a Community. Ecclesiastically it means the Head of the Fathers (Bishops) and their congregation of faithful. This title is historically known as “Patriarch of Alexandria and all Africa on the Holy Apostolic Throne of Saint Mark the Evangelist,” that is “of Alexandria and of all Africa.” The title of “Patriarch” was first used around the time of the Third Ecumenical Council of Ephesus, convened in 431 C.E., and ratified at Chalcedon in 451 C.E. Besides Egypt, the Bishop of Alexandria has jurisdiction over Pentapolis, Libya, Nubia, Sudan, Ethiopia, Eritrea, and all Africa. Both the Patriarchate of Addis Ababa and all Ethiopia and the Patriarchate of Asmara and all Eritrea do acknowledge the supremacy of honor and dignity of the Pope and Patriarch of Alexandria on the basis that both Patriarchates were established by the Throne of Alexandria and that they have their roots in the Apostolic Church of Alexandria, and acknowledge that Saint Mark the Apostle is the founder of their Churches through the heritage and Apostolic evangelization of the Fathers of Alexandria. In other words, the Patriarchate of Addis Ababa and all Ethiopia and the Patriarchate of Asmara and all Eritrea are daughter Churches of the Holy Apostolic Patriarchate of Alexandria. In addition to the above, the countries of Uganda, Kenya, Tanzania, Zambia, Zimbabwe, the Congo, Cameroon, Nigeria, Ghana, Botswana, Malawi, Angola, Namibia, and South Africa are under the jurisdiction and the evangelization of the Throne of Alexandria. It is still expanding in the vast continent of Africa. The Coptic Church has played a significant role in Christian history in many ways. For example, the Catechetical School of Alexandria is the oldest catechetical school in the world. St. Jerome records that the Christian School of Alexandria was founded by Saint Mark himself. Around 190 C.E. under the leadership of the scholar Pantanaeus, the school of Alexandria became an important institution of religious learning, where students were taught by scholars such as Athenagoras, Clement, Didymus, and the native Egyptian Origen, who was considered the father of theology and who was also active in the field of commentary and comparative Biblical studies. Origen wrote over 6,000 commentaries on the Bible in addition to his famous Hexapla. Many scholars such as Jerome visited the school of Alexandria to exchange ideas and to communicate directly with its scholars. The scope of this school was not limited to theological subjects; science, mathematics and humanities were also taught there. The question-and-answer method of commentary began there, and fifteen centuries before Braille, wood-carving techniques were in use there by blind scholars to read and write. Coptic Christianity was also the cradle of Christian monasticism. Many Christians went to the Egyptian desert and remained there to pray and work and dedicate their lives to seclusion and worship of God. These individuals provided the beginning of the Christian monastic movement, which was organized by Anthony the Great, Saint Macarius the Great and Saint Pachomius. Christian Monasticism was instrumental in the formation of the Coptic Orthodox Church character of simplicity and humility, thanks to the teachings and writings of the Great Fathers of Egypt's Deserts. By the end of the fifth century, there were hundreds of monasteries, and thousands of cells and caves scattered throughout the Egyptian desert. A great number of these monasteries are still flourishing and have new vocations to this day. All Christian monasticism stems, either directly or indirectly, from the Egyptian example: Saint Basil the Great Archbishop of Ceasaria of Cappadocia, founder and organizer of the monastic movement in Asia Minor, visited Egypt around 357 C.E. and his rule is followed by the Eastern Orthodox Churches; Saint Jerome who translated the Bible into Latin, came to Egypt, while en route to Jerusalem, around 400 C.E. and left details of his experiences in his letters; Saint Benedict also founded the Benedictine Order in the sixth century on the model of Saint Pachomius, but in a stricter form. Countless pilgrims have visited the "Desert Fathers" to emulate their spiritual, disciplined lives. ↑ Geocities, Split of the Byzantine and Oriental Churches. Retrieved September 14, 2008. ↑ Greek Orthodox Patriarchate of Alexandria, Homepage. Retrieved September 14, 2008. ↑ John S. Romanides, Leo of Rome's Support of Theodoret. Retrieved September 14, 2008. ↑ Jill Kamil, Coptic Egypt: History and Guide (Cairo: American University in Cairo, 1997). ↑ World Council of Churches, WCC official visit to Ethiopia. Retrieved September 14, 2008. ↑ Orthodox Wiki, Official Statements on Christology. Retrieved September 16, 2008. ↑ Coptic Church, Chapter 1. Retrieved September 16, 2008. Bagnall, Roger S. Egypt: From Alexander to the Copts: An Archaeological and Historical Guide. British Museum Press, 2004. ISBN 978-0714119526. Carroll, Diane Lee. Looms and Textiles of the Copts: First Millennium Egyptian Textiles in the Carl Austin Reitz Collection of the California Academy of Science. Univ of Washington Pr. 1998. ISBN 978-0295966724. Chitham, E. J. The Coptic Community in Egypt: Spatial and Social Change. Durham, NC: University of Durham, Centre for Middle Eastern and Islamics Studies, 1986. ISBN 0903011158. Courbage, Youssef and Phillipe Fargues. Judy Mabro (Translator). Christians and Jews Under Islam. 1997. ISBN 978-1860642852. Hamilton, Alastair. The Copts and the West, 1439-1822: The European Discovery of the Egyptian Church. Oxford University Press, 2006. ISBN 978-0199288779. Kamil, Jill. Coptic Egypt: History and a Guide, Revised Ed. American University in Cairo Press, 1990. ASIN B000S71OK0. Meinardus, Otto. Two Thousand Years of Coptic Christianity. American University in Cairo Press, 2002. ISBN 9774247574. Wakin, Edward. A Lonely Minority: The Modern Story of Egypt's Copts. Backinprint.com. (original 1963) 2000. ISBN 978-0595089147. This page was last modified on 20 October 2008, at 17:23.